The VTS and the GUZ- Series Tanks: Ideal for both indoor and outdoor use. You can order custom color-coded tanks for more efficient product identification at no additional charge. VTS-Series Tank: Completely flat bottom for easy mounting. Ample, 7 inch diameter fill cap. Fits on 48 inch x 48 inch pallet. Order ball valve separately. GUZ-Series Tank: All polyethylene with integral 2-way fork entry base for more efficient transport. Fill opening is 22 inch in diameter, has standard drum-type cover, and lever-latch ring. Supplied with 2inch NPS ball valve. Designed to fit on 48 inch x 48 inch pallet. 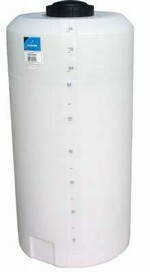 We sell high quality IBC containers, totes or tanks and replacement parts. We've helped many companies to solve all of their IBC containers and IBC parts needs. See this IBC & Parts Diagram or IBC Valve & Accessories Diagram.